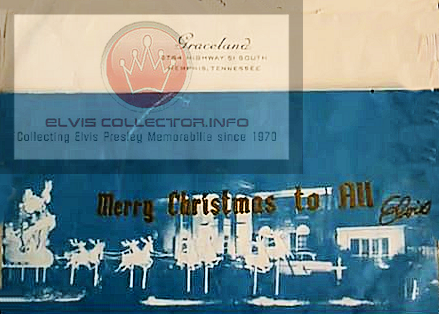 The photograph above is a very rare Christmas card from Elvis and his infamous home…Graceland. This Christmas card is one of many that I have but it is among my favorite(s). There is no doubt that Elvis was proud of Graceland and loved spending Christmas there. Christmas, and the weeks leading up to, was Elvis’ favorite time of the year. He loved the decorations, the smiles on others faces, the gracious acts of people during this time of year, buying presents for others, reflecting back on the year and looking forward to the next, and most of all having; friends, loved ones, relatives, etc. with him to share memories – love – time and more. To those who were able to look upon Graceland, especially from the years of 1966 through 1973, the tasteful decorations – the lights – and the beauty would literally cause cars passing by to brake and the passengers look in wonder. It was a beautiful sight to behold and Elvis took great pride in illuminating Graceland and he never grew tired of driving through the gates of Graceland winding up towards his home looking at the spectacle of lights. Even during the saddest Christmas of his life, which was Christmas of 1958 as his mother had died a few months earlier on August 14, 1958, Elvis still found the time to think about others and try to make it a special time…for others. Interestingly, though Elvis is the most successful recording artist ever (note: in many categories including pertaining to Christmas songs (i.e. total album sales, total single sales, number of hits on Billboard, etc.) the music playing at Elvis’ home were those of other artists such as; Dean Martin, Gene Autry, Bing Crosby, and others. Elvis recorded his first Christmas album in sessions of September 5 – 7, 1957 at Radio Recorders in Hollywood entitled “Elvis’ Christmas Album” and was released in October 1957. Content included Christmas hymns, secular Christmas songs and non-holiday gospel numbers. It initially hit #1 for 4 weeks on Billboard’s pop album chart and revisited the chart due to strong sales in subsequent holiday seasons through 1962. It was repackaged with a new cover in 1958. There were other reissues with altered content and cover later on. Working the sessions with Elvis were Scotty Moore (guitar), Bill Black (bass), D. J. Fontana (drums), Dudley Brooks (piano), and backing vocalists The Jordanaires and Millie Kirkham. These sessions were Millie’s first work with Elvis, who, ever the gentleman, took special care to see to her comfort because she was seven months pregnant at the time. Millie performed a soprano obbligato (in a “winter wind” sort of effect) behind Elvis’ lead on the song “Blue Christmas”, a song that over the years would become synonymous with Elvis and Christmas. During the session, song writers Leiber and Stoller wrote for Elvis a song called “Christmas Blues”. By the end of the session it was renamed “Santa Claus Is Back In Town” and it became another famous Elvis Christmas song. Material unrelated to the Christmas album was also recorded at these sessions. Elvis recorded a second Christmas album called “Elvis Sings The Wonderful World of Christmas” in sessions of May 15 -21, 1971 at RCA Studio B in Nashville. It was released October of 1971. Players were James Burton (guitar), Chip Young (guitar), Charlie Hodge (guitar), Norbert Putnam (bass), Jerry Carrigan (drums), Larry Londin (drums), Kenneth Buttrey (drums), David Briggs (piano), Imperials member Joe Moscheo (piano), Elvis Presley (piano), Glen Spreen (organ), and Charlie McCoy (organ, harmonica and percussion). Backing vocalists were The Imperials, June Page, Millie Kirkham, Ginger Holiday and Temple Riser. For this album producer Felton Jarvis attempted to set the Christmas mood in May by having the studio decorated with a tree and empty boxes beautifully wrapped. Elvis even brought gifts for everyone, presenting each with engraved gold bracelets that said “Elvis ’71″. I hope that you enjoyed this article and may God bless you all.